Cape Town, 25 June 2018: The Deep South, often jokingly referred to by people up the line, as ‘behind the lentil curtain’ is living up to its name, with Neighbourhood Farms flourishing at the first of 11 schools, and the provincial hospital set to be the greenest healthcare facility in the city of Cape Town. Neighbourhood Farms, an adventure into health and well-being, social connectivity and community identity, all buried deep in rich organic neighbourhood gardens, aims to benefit the 100 000 people living in the Valley and is pioneered by organic food activist and TV cook Justin Bonello and co-founder Erik Haraldsen. “Market gardens are nothing new, they have been around for hundreds of years, where people grew their own produce and sold what was extra. It’s a celebration of local,” said Bonello, who himself nurtures a 200sqm permaculture garden in his front yard. “Our vision is to recreate the village of our collective memory, it’s impossible for us to operate 15 000 market gardens around the country, but if we create an open source system that can be shared from the North West to the Eastern Cape, we’ll all be eating more healthily, taking better care of the planet and knowing each other better,” he added passionately. “The Oranjezicht Community Farm is a fantastic example of community market gardening. We have an obligation as an organisation to expand their thinking and making this the status quo in the suburbs,” says co-founder Erik Haraldsen. The project at False Bay Hospital is a partnership between the Permaculture Research Centre and Neighbourhood Farms to utilize under-used space for the broader community in the middle of Fish Hoek. “Research shows, a connection with nature brings about healing benefits, said Dr Wendy Waddington, representing the False Bay Hospital Facility Board. “This Neighbourhood Farm will be developed hand in hand with the hospital and phased in over time. “It’s our vision to create the greenest hospital in Cape Town which can be copied and replicated countrywide,” added Justin. The False Bay Hospital site will include the market garden, a training garden, packing shed and washing facilities. “The hospital is on a journey towards ensuring it’s water secure, and the garden will ensure food security, as well as an opportunity to raise funds for the FBH Facility Board to provide comforts for patients by selling fresh produce to the local community,” added Dr Waddington. Surplus and nutrient dense produce will go into the hospital as well as Meals on Wheels whose kitchen is based at the hospital. The first planting begins at False Bay Hospital in June. The False Bay Hospital will host the NF training centre for the South Peninsular, offering permaculture courses to local residents and upskilling people from under-resourced areas to becoming urban farmers. “Each garden location provides work for two or three full-time gardeners. 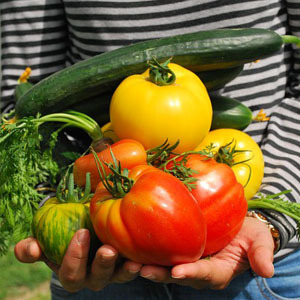 Our vision for the Deep South is that eventually, all the 17 local schools will grow their own Neighbourhood farm which provides nutrient goodness for the 15 000 strong school communities, create employment and garner closer connection,” said Bonello. Kommetjie Primary was the first school to embrace the concept of a neighbourhood farm. “Kommetjie Primary is our pilot project. The ground was prepared in March and planted a month later. We’re streamlining our systems such as picking, packing and processing and expect ot have produce for sale in the third term,” said Bonello. The small family of Kommetjie Primary School believes that urban agriculture is beneficial to the environment, and to the health and wellbeing of community members. “Improved nutrition, lifestyle changes for healthy living, and improved food security combined to create environments where families and communities connect, makes Kommetjie Primary School a proud participant in this remarkable project,” said George Gueorguiev, Principal of Kommetjie Primary School. “The new gardens are an inspiration for our precious students and provide a learning opportunity and experience,” Gueorguiev concluded. Each local school Neighbourhood Farm will give local entrepreneurs an outlet for their produce such as honey, bread, bottled fruit and vegetables.